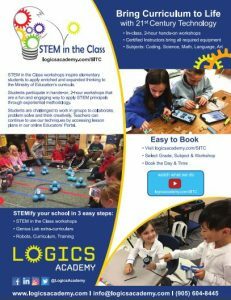 STEM in the Class workshops from Logics Academy inspire students from Kindergarten to Grade 8 to apply enriched and expanded thinking to the Ministry of Education’s Science, Technology, Math, Language & Art curricula. Students participate in hands-on, 2-hour workshops that are a fun and engaging way to apply STEM principals in experiential methodology with Robotics & Coding. Students are challenged to work in groups to collaborate, problem solve and think creatively. Logics certified instructors bring everything required for these innovative workshops and teachers can continue to use our techniques by accessing lesson plans in our online Educators Portal. Select your grade below to find a workshop that suits your class and register today! Please choose the grade(s) applicable for your class or school to see the available workshops from Logics Academy. Logics Academy provides products and resources for the Canadian classroom, educator professional learning programs and direct to student workshops and courses in and out of the classroom. 160 Gibson Drive, Unit 13. Sign up for the latest Logics news direct to your inbox!